It has nearly 100 rooms, but this hotel—brilliantly located just minutes from Grafton Street—likes to describe itself as a boutique property, and it does manage to convey the personal touch of a much smaller establishment. The decor, which has personality in both the rooms and the warm public spaces, helps, as does the helpful and cheery welcome. Guest rooms are bright, with quirky decorative touches like a poster with the heights of monuments around the world compared to a pint of Guinness. The beds are so big you could get lost in them, and each comes with a five-choice "pillow menu". The blend of modern comfort (air-conditioning, for example) and Irish personality (some of the furniture is handmade in Galway) is pitch perfect. YOU SHOULD KNOW On our visit, we found the Wi-Fi a little patchy. Bathrooms are spacious and clean, with power showers in the standard rooms and toiletries provided by The White Company. The small-ish lobby has some quite jazzy zigzag patterning but if you can get past that, it's actually quite a cool space, and staff are great. Breakfast in Francesca's cozy, gently-lit restaurant is delicious, and the evening tapas menu is good too - expect local, seasonal food, as the head chef has a passion for foraging. The open kitchen is a nice touch. Jasmine Bar, with its leather chairs, high-veneer oak paneling, and decorative bookcases, is a grown-up, comfortable bar that takes its whiskey seriously - it's on the Irish whiskey trail and featured on a best whiskey bars in the world list by Whisky Magazine. You can do tastings, too. For non-whiskey fans, there are plenty of other drinks, and the hotel's proximity to the Gaiety Theatre means it's a good option for a pre- or post-theater tipple. The hotel has a cute private cinema available for hire. 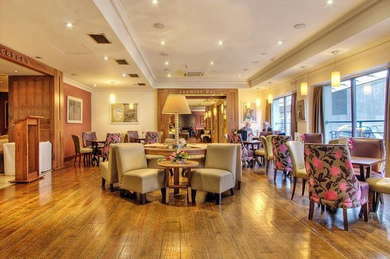 The hotel is right in the middle of everything, located as it is in Dublin's shopping and creative quarter. Almost everything is within walking distance. You're surrounded by great options here, and you should ask staff for their latest recommendations, but we'd also back the reliably cool tapas restaurant, Fade Street Social (1-minute walk) for the vibe and the food. Or try some great Thai and Vietnamese cuisine in a funky setting at Saba (3-minute walk). The Long Hall (2-minute walk) is a gorgeous and authentic old Irish pub. Or try the buzzing late-night Bar With No Name (1-minute walk). A fantastic location is backed up a hotel with more personality than a lot of properties this central and this size. We particularly like the Irish whiskey focus at the bar and the helpful staff. A great bet for a city center break.